Kohler Co.’s proposed 18-hole golf course, to be located on land Kohler has owned in the Town of Wilson, Sheboygan County, for more than 75 years, will be a world-class public course that offers golfers an unmatched experience while reinforcing the company’s commitment to environmental stewardship. The course will be designed by Hall of Fame golf course architect Pete Dye, known worldwide for his unique, environmentally sensitive, championship-level courses. The project also includes plans for a clubhouse, lodge and locker room, which will apply for LEED green building certification. There will also be an onsite restaurant open to the public. 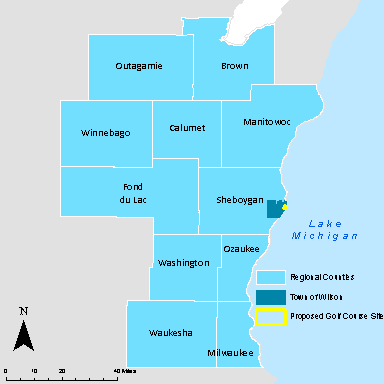 The Wisconsin Department of Natural Resources has scheduled a public hearing to get citizen input on Kohler Co.’s proposal to build an 18-hole, minimalist-design public golf course on land the company owns in the Town of Wilson. The project is currently undergoing an extensive review and approval process involving the Town and the Wisconsin Department of Natural Resources. Kohler Co. is committed to doing this project right, building on the company’s long history of quality, innovation and environmental sustainability. Kohler believes sound business decisions are inherently linked to a strong environmental commitment, and this project will reflect the company’s decades-long commitment to sustainability. Kohler’s other courses at Whistling Straits and Blackwolf Run mirror this approach, and this new golf course will also achieve that high standard of innovation and quality by which other courses are judged. Kohler is working through the Town of Wilson and the Wisconsin Department of Natural Resources to make sure it follows all rules and regulations that apply. The company believes this project will benefit the Town of Wilson, Sheboygan County and the region, and is committed to doing so in an environmentally responsible manner that considers public feedback throughout the process. There will be public hearings and approvals before any construction work begins, and public feedback will be considered throughout the development process. For many golfers, playing the Kohler courses is a “bucket-list” experience. The goal is to create a new course that captures and enhances the environmental beauty of the site and is recognized as being one of the top 50 courses in the world. 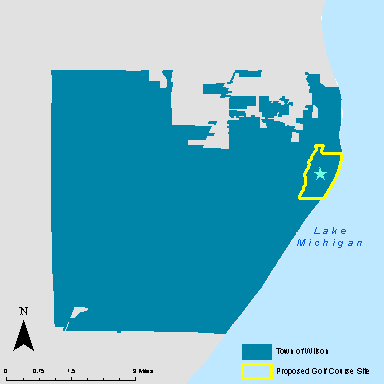 The Town of Wilson and the proposed golf course in relation to the area. The proposed golf course in relation to the Town of Wilson.